community know all about your fabulous work! First, there’s the way Google finds you. According to one Etsian who seemed pretty techno-savvy, while on Etsy, your tags may be your most important search tool, Google only picks up your title. I’ve noticed that a lot of Etsy shops get creative in their titles but leave out the all-important search words customers are looking for. For example, I have an album titled “Innocence” in my store. It’s a baby pic and that title provides the right sentiment. But…in the same title I have Personalized Baby Photo Album, which is what I would expect customers to search. I also have “photo album” and “baby” in my tags, because I think the important search terms bear repeating. Some Etsians try to only use search words in one place. But this isn’t eBay and you have unlimited space in your title. What can it hurt to use an important search word twice? And I know I’ve said this before but remember to think like a customer when developing your keyword strategy. How would potential customers search for your products? There’s a tool on Google called Google Base. I’ve just gotten around to listing my items here, but wow, this is cool. You need a gmail account to access google base, and if you don’t have one of these, it’s free and there’s lots of space and it’s userfriendly and keeps the spam out. Get a gmail account and sign into it. And that’s it. Supposedly in just a couple of hours, your items will appear on Google under the keywords that are in your titles. There are great tutorials on Google too for how to do this. I’m a first-timer myself. Reading the Etsy forums today, I came across a post from momomatic, who had some great suggestions for building buzz for your etsy store or crafty website. You can read the whole post here on the Etsy forums. The piece that I found interesting though was a link to go submit your etsy store or website or blog to google so the searchbot can crawl your site and get you in the search engine. It’s simple and it’s free. Just make sure your site or etsy store is optimized with good search keywords so you end up in the searches that will bring you hordes of customers! Tags, Titles and Keywords…Oh My! There is so much to know when setting up any online business, and this includes crafting. Sites like Etsy and eBay make it easy to get started, but if you don’t know the first thing about keywords, you can have the most beautiful, high-quality, deal-of-the-century products on the planet and you might find yourself with no sales. Here’s something I’ve noticed about us crafters. We’re experts in our crafts. We know the materials, the technical names for gems and tools and techniques, and we can explain the intricacies of binding a book or creating a one-of-a-kind necklace. However, our customers do not think the same way. As a matter of fact, they probably know very little about the specifics of our products, other than it’s the perfect gift they were looking for or those darling tanzanite earrings will go perfect with the little black dress. Ok, so keywords. On google, on eBay, on Etsy and just about anywhere else potential customers search, they use keywords to find your products. But they aren’t necessarily using the same keywords you are using, and unfortunately, if this is the case, they will find someone else with less spectacular tanzanite earrings but better keywords. When you are deciding on your online keywords, you need to think like a customer. If you were explaining your product to your non-crafting friends, how would you describe your product? For my photo albums, I make sure I use the terms personalized and gift wherever possible. And I get specific–baby gift, wedding gift, sweet sixteen gift. When I’m looking for something online, I’m often searching for something general and I almost never know the technical terms. There is a great tool on google where you can get keyword ideas and see how many people are searching those terms and how related terms stack up. It’s used for google adwords, but it works for deciding on your keywords everywhere else too, and it’s free. You want to find keywords that work for your product but are not too competitive. Keep in mind, you may need to experiment to get the perfect keyword combination. What works for someone else may not work for you. So why in my title here, do I have keywords, tags and titles? Well, they all do the same things in different places. 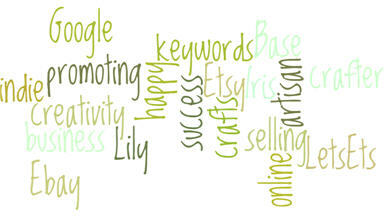 On Etsy, your tags are your search tools and keywords out to google. But keep in mind that your title gets picked up in Etsy searches as well. It’s great to have a creative name for your item in your Etsy listing title, but if you don’t say what it is, you may not show up in a search for photo albums or necklaces or baby clothes. Make sure your titles clearly explain your product. And use your 14 tags (keywords) wisely. Colors, what the product is and how it can be used are helpful. And if you find yourself at a loss, use your store name or user id. You never know who remembered your name from the last time they were in your store–great branding too. On eBay, your listing titles are the important place for your keywords. You have 55 characters there. Make sure they count! No one, and I mean no one, searches for L@@K! And on your website, you have something called meta tags (these are behind the scenes keywords that should be filled out so the google searchbots can find you and put you in the search engine.) When developing a website, always make sure your web designer knows to add meta tags, meta description and meta title. And make these three things count!